Nothing to see here, except perhaps a fantastic buy-in opportunity. 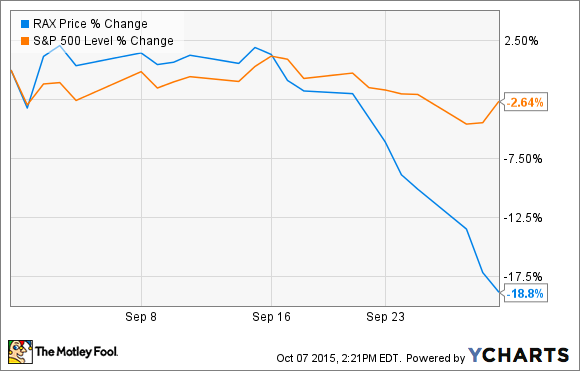 What: Shares of Rackspace Hosting (NYSE:RAX) fell 18.8% in September according to data from S&P Capital IQ. It was the second terrible month in a row for the purveyor of data center management and specialized networking solutions. From the end of July to the start of October, the stock lost a hair-raising 27.5% of its former value. So what: The August drop sort of made sense, since Rackspace bears could hang their hats on a decent second-quarter report with a side of disappointing forward guidance. September's continued plunge, on the other hand, rested on no particular news at all. If I bent over backwards to find a negative catalyst, I'd point out that fellow data center manager Internap (NASDAQ:INAP) slashed its revenue and profit estimates near the end of the month. And if you're into mixed signals, a rash of analysts either downgraded Rackspace or lowered their target prices around the 11th of September -- rebuked by a comparable number of companies moving in the opposite direction. I suppose that should trigger a slide if investors trust the bearish analysts more than their bullish counterparts. Now what: Rackspace has started to bounce back from this senseless slide, rising 14% in the first four trading days of October. The positive catalyst here is a brand-new partnership with Amazon.com (NASDAQ:AMZN), which allows Rackspace to bundle its prize-winning support services with Amazon's market-leading cloud computing platform. The company actually signed a similar deal with Microsoft (NASDAQ:MSFT) in July, adding Rackspace's trademark "fanatical support" to Redmond's Windows Azure platform. Locking arms with Windows Azure obviously didn't lift Rackspace's shares, but landing a deal with Amazon's dominant cloud products sure did. These deals undermine Rackspace's own cloud computing solutions, but they also give the company a way to stay relevant even if the Rackspace Cloud fades into obscurity. The company has always prided itself on first-class support services, and it may now become a bundled support partner for pretty much any of the largest cloud platforms on the market today. None of that played into September's market action, of course. I'm just painting a picture of what's next for Rackspace -- and why this two-month plunge shouldn't be seen as a harbinger of impending doom. This company can still find a useful place in the emerging big data and Internet of Things markets. Meanwhile, Rackspace shares are selling at rock-bottom price-to-earnings ratios not seen since 2009. I can't guarantee that you'll ever be able to sell this stock high, but you can certainly buy low right now.